Opening Night at the Bullring is tomorrow! Bakersfield, Calif. (March 23, 2017) - It wasn't easy, but Thursday was Todd Gilliland's day at Kern County Raceway Park. After winning the only practice of the day at the California track, the 16-year-old from Sherrills Ford, North Carolina, piloted his No. 16 NAPA Auto Parts Toyota to his eighth career 21 Means 21 Pole Award in the NASCAR K&N Pro Series West. He then backed it all up with the victory in the NAPA Auto Parts 150. The win, his eighth in the series, keeps his chances alive to compete for a $10,000 prize in the NAPA 500 Challenge. He must finish in the top three in the next two races at California's Irwindale Event Center to win the bonus money. Going into overtime after multiple late-race cautions, the 156-lapper came down to Billy McAnally Racing teammates Gilliland and Derek Kraus. Though 15-year-old Kraus made some gutsy moves to get his No. 19 Carlyle Tools Toyota alongside Gilliland in the closing stages, the Stratford, Wisconsin, driver came up short, finishing second in only his second K&N Pro Series West start. Kraus was not the only one to contend with Gilliland, however, as Michael Self was the top driver for the first half of the race in his No. 9 Sunrise Ford/Eibach Springs/Lucas Oil Ford. Leading 84 laps, the early pace soon atrophied for the 26-year-old from Park City, Utah, as he lost the lead to Gilliland on Lap 95 and fell outside the top three. Shortly after, the six-time K&N Pro Series West race winner battled with Chris Eggleston and Will Rodgers to come home in sixth. The night went much worse for a few other series talents, as Brandon Schilling brought out two cautions throughout the night after losing his No. 30 Family Air/Tucson Speedway Ford in Turn 2. Julia Landauer, who qualified seventh, ran as high as second in her No. 6 Sunrise Ford/Eibach Springs/Lucas Oil Ford. The run came to an end on Lap 97 when she crashed with Matt Levin, later ending her night in the 12th spot. Rounding out the top-five behind Rodgers and Eggleston was 10-time series race winner, David Mayhew. He was followed by Nicole Behar, who rallied from the rear of the field after an unapproved adjustment, in seventh with Blaine Perkins, Kody Vanderwal and Todd Souza completing the top-10. The NAPA 150 from Kern County Raceway Park will air on NBCSN Tuesday, March 28 at 7 p.m. ET/4 p.m. PT. The NASCAR K&N Pro Series West will be back in action Saturday at Irwindale Events Center for the NAPA Twin 100s. 1. (1) Todd Gilliland, Sherrills Ford, N.C., Toyota, 156 laps, 66.905 mph. 2. (6) Derek Kraus, Stratford, Wis., Toyota, 156. 3. (3) Will Rodgers, Murrieta, Calif., Ford, 156. 4. (2) Chris Eggleston, Erie, Colo., Toyota, 156. 5. (9) David Mayhew, Atascadero, CA, Chevrolet, 156. 6. (5) Michael Self, Park City, UT, Ford, 156. 7. (23) Nicole Behar, Spokane, WA, Toyota, 156. 8. (8) Blaine Perkins, Bakersfield, Calif., Chevrolet, 156. 9. (12) Kody Vanderwal, LaSalle, Colo, Ford, 156. 10. (11) Todd Souza, Watsonville, Calif., Toyota, 156. 11. (13) Johnny Borneman, Ramona, CA, Ford, 156. 12. (7) Julia Landauer, New York, N.Y., Ford, 155. 13. (16) Rich DeLong III, Santa Clarita, Calif., Chevrolet, 155. 14. (14) Ron Norman, Tucson, Ariz., Chevrolet, 155. 15. (4) Matt Levin, Tucson, Ariz., Chevrolet, 154. 16. (20) Jesse Iwuji, Carrolton, Texas, Chevrolet, 154. 17. (19) Bill Kann, Scottsdale, Ariz., Toyota, 154. 18. (10) Garret Archer, Maple Valley, Wash, Ford, 154. 19. (21) Takuma Koga, Nagoya, Japan, Chevrolet, 153. 20. (17) Salvatore Iovino, Los Angeles, Calif., Chevrolet, 150. 21. (18) Dan Phillippi, Los Angeles, Calif., Ford, 145. 22. (15) Brandon Schilling, Sierra Vista, Ariz., Ford, 142, accident. 23. (22) Justin Funkhouser, Paradise, CA, Chevrolet, 73, overheating. Caution Flags: 6 for 25 laps. Lap Leaders: T. Gilliland 1-10; M. Self 11-94; T. Gilliland 95-156. 5. N. Behar, 71; 6. K. Vanderwal, 71; 7. B. Perkins, 69; 8. G. Archer, 67; 9. J.
Landauer, 64; 10. M. Levin, 60. DAYTONA BEACH, Fla. — The NASCAR K&N Pro Series West will hold three races in three days with the NAPA Auto Parts 150 at Kern County Raceway Park in Bakersfield, California, on Thursday, March 23, and the NAPA Twin 100s at Irwindale Speedway in Irwindale, California, on Saturday, March 25. Below is a look at the three events and some of the selected participants. • For the sixth time in history, Kern will host the NASCAR K&N Pro Series West after opening in 2013. • Chris Eggleston of Erie, Colorado, holds the series point lead after winning the season-opening event last week in Tucson over Bill McAnally Racing teammate Todd Gilliland. • Gilliland won the race at Kern from the pole last season. • If Eggleston can win the NAPA Auto Parts 150, he will be halfway to winning the $100,000 NAPA 500 Challenge Series. 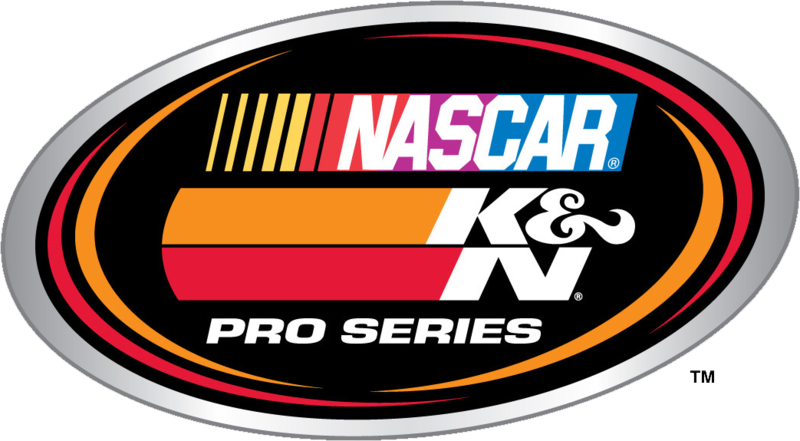 • The K&N Pro Series West will hold two 100-lap events at Irwindale, with each standing as a separate points-paying event. • Todd Gilliland won the only race at Irwindale in 2016, the season opener, to become the sixth different winner at the track over the last six races there. • The races are the final two races in the NAPA 500 Challenge Series, which promises a $100,000 bonus to the driver who can win all four races to begin the season. • The track has held one K&N West race each year since its opening, with the lone exception being the 2014 season when it held two races. • Greg Pursley is the only repeat winner at Kern. • Irwindale Speedway opened in March 1999 and has capacity for 6,500 spectators. • The facility is in the San Gabriel Valley of Southern California and is just 25 minutes from downtown Los Angeles. • There are multiple racing configurations available with half-mile and third-mile ovals along with a 1/8-mile drag strip. • The half-mile track was home to the NASCAR Toyota All-Star Showdown, a special non-points event for the NASCAR K&N Pro Series and NASCAR Whelen All-American Series, from 2003-11. • This is the series’ sixth event at Kern and the 25th race in its history at Irwindale. • Four different drivers have won at Kern, with Greg Pursley winning twice. • Fourteen different drivers have won at Irwindale, led by Austin Cameron with five wins. • Four different drivers have won the pole at Kern, led by Pursley’s two, and three times the race has been won from the pole. • Fifteen different drivers, led by Jason Bowles with three, have won the pole at Irwindale. • Nine different drivers, led by Butch Gilliland with five, have earned the pole award at Irwindale. 150-lap Race Record: Greg Pursley, 1 hour 10 minutes 46 seconds, 63.589 mph, Oct. 26, 2013. 1-lap Qualifying Record: Butch Gilliland, 17.871 seconds, 100.722 mph, June 19, 1999. • Finished a career-best third in the season opener at Tucson. • Has made only two career K&N West starts and has never competed at Kern or Irwindale. • Finished 10th in the season opener at Tucson last week. • Posted a career best finish of second at Irwindale in 2015. • Finished 21st in only career attempt at Kern. • Has six career K&N West wins with 20 top fives and 23 top 10s in 32 career starts. • Won the season opener at Tucson after leading a race-high 80 laps. • Has finished fifth in each of his two career starts at Kern, where he’s never started worse than third. • Has one career win at Irwindale in two starts, having finished third at the track last year. • Won six of 14 races last season with 11 top fives and 13 top 10s en route to the K&N West championship, becoming the youngest champion in NASCAR touring series history at 16 years, five months, and joined his grandfather Butch Gilliland as a K&N West champion (1997). • Finished second in the season opener at Tucson. • Won the pole and the race last season in his only career start at Kern. • Also won the pole and the race last season in his only career start at Irwindale. • Plans to run both the K&N West and K&N East schedules in 2017. • Finished fourth in the final standings last season to become the highest finishing female driver in K&N West history. • Finished 12th in the season opener at Tucson. • Finished 10th last season at Kern in her only career start at the track. • Finished eighth at Irwindale in 2016 in her debut at the track. • Made his K&N Pro Series debut with the East at New Smyrna and finished third, following that effort with a sixth-place finish in the West season opener at Tucson. • Has never competed at either Kern or Irwindale. • Competed in six races a year ago and will run for K&N West Rookie of the Year this season. • Finished a career-best sixth in the season opener at Tucson. • This marks the first year that Irwindale will host two, separate events on the same night for the K&N Pro Series West. DAYTONA BEACH, Fla. (March 20, 2017) — Just five days after kicking off the 2017 season at Tucson Speedway, NASCAR K&N Pro Series West teams will be put to the test with three races in a three-day span to close out the NAPA 500 Challenge series. The series heads to Kern County Raceway Park in Bakersfield, California, for the NAPA Auto Parts 150 on Thursday, March 23, before rolling to Irwindale Speedway in Irwindale, California, for the NAPA Auto Parts Twin 100s on Saturday, March 25. The Twin 100s will stand as two separate points-paying events. 2015 K&N West champion Chris Eggleston got his season started on the right foot, holding off his Bill McAnally Racing teammate Todd Gilliland — last season’s series champion — to win at Tucson on Saturday. If he can sweep the tripleheader this week, he would earn the $100,00 prize that comes with capturing all four legs of the NAPA 500 Challenge. It won’t be easy for Eggleston. Gilliland led 70 of the 150 laps at Tucson after winning the pole for the season opener. Rookie Garrett Archer, in a Jefferson Pitts Racing Ford, was a strong contender at Tucson, Zane Smith and Will Rodgers. Of the drivers entered at Kern and Irwindale, only Eggleston and Gilliland have won races at either track. EVENT SCHEDULE: Thursday, March 23 – Garage opens: 11 a.m.; Practice: 2-3:30 p.m.; Group qualifying: 4 p.m.; Driver autograph session: 6:15 p.m.; NAPA Auto Parts 150: 7:45 p.m. EVENT SCHEDULE: Saturday, March 25 – Garage opens: 10 a.m.; Practice: 2:05-2:50 p.m.; Final practice: 3:05-3:50 p.m.; Group qualifying: 4:20 p.m.; Driver autograph session: 6 p.m.; NAPA Auto Parts Twin 100s (Race 1): 7 p.m.; NAPA Auto Parts Twin 100s (Race 2): 9:30 p.m. The Races: NAPA Auto Parts 150 and the NAPA Auto Parts Twin 100s will be the second, third and fourth of 14 races on the 2017 NASCAR K&N Pro Series West schedule. The Procedures: For all three events, the maximum starting field is 26 cars, including provisionals. The first 22 cars will secure starting positions based on the group qualifying process. The remaining four spots will be awarded through the provisional process. At Kern, the race will be 150 laps (75 miles) with a five minute break occurring at or near the conclusion of lap 75. At Irwindale, following the conclusion of the first 100-lap race, there will be an approximately 90-minute break for teams to prepare for the second event and get through pre-race technical inspection. 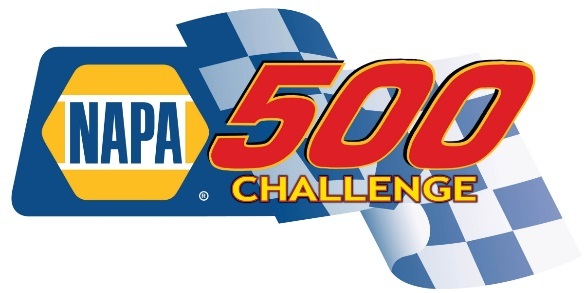 NAPA 500 Challenge: The NAPA Auto Parts 150 at Kern is the second race in a four-race “NAPA 500 Challenge Series.” With the K&N West competing in four events over an eight-day stretch to begin the season, NAPA is offering a $100,000 bonus to any driver to win all four races. $10,000 will be given to any driver who can finish in the top 3 in all four events; $5,000 to any driver finishing in the top 5 in all four; and $1,000 to a driver who finishes in the top 10 in all of them. The series finishes with the Twin 100s at Irwindale on Saturday. The Tracks: Kern County Raceway Park sits on 120 acres and opened on May 18, 2013 with a NASCAR Whelen All-American Series event. It’s a half-mile oval with progressive banking of 12 to 14 degrees in turns and eight degrees on the front and backstretches. Irwindale Speedway is a half-mile paved oval with progressive banking of between six and 12 degrees in the corners and six degrees in the straights. Located in the San Gabriel Valley, Irwindale is just 25 minutes from downtown Los Angeles and features multiple racing configurations with half-mile and third-mile ovals along with a 1/8-mile drag strip. Race Winners: There have been four different winners in the five previous K&N West races at Kern. Greg Pursley, the only repeat winner at the track, won the first two races held there. Todd Gilliland, winner of last year’s race at the track, is the only active driver with a win at Kern. There have been 14 different winners in the previous 24 races at Irwindale, with Austin Cameron owning five career wins at the track. NASCAR XFINITY Series driver Brendan Gaughan and Jason Bowles each have three wins there. Pole Winners: There have been four different pole winners in the five previous races at Kern, with Greg Pursley winning two of them. At Irwindale, there have been 15 different pole winners in 24 previous races. Jason Bowles won three poles, while six drivers all have two. Rookie Roll Call: Series rookies finished in positions three through eight at Tucson. Garrett Archer, Zane Smith and Will Rodgers finished in the top five, with Kraus, Brandon Schilling and Kody Vanderwal finishing behind that trio. Archer’s third-place finish came in only his second career series start. The learning curve will be steep this week: None of that impressive rookie crop has ever made a start at either Kern or Irwindale. Right Direction: Blaine Perkins has never finished in the top 15 at either Kern or Irwindale, but he’s coming off a solid 11th-place showing at Tucson and he has some history on his side at Irwindale. Crew chief and car owner Steve Portenga has two career wins at Irwindale as a driver, including the inaugural K&N West race at the track in 1999. Over the two wins, the second of which came in 2005, Portenga led 150 of the 400 laps he completed. Heading West: The first third of the K&N Pro Series West schedule coincides with the Monster Energy NASCAR Cup Series and its “NASCAR Goes West” swing, which began in Las Vegas and Phoenix and continues through Auto Club Speedway in Fontana, California. Four of the top six drivers in the Cup Series standings have won K&N West races in their careers — including point leader Kyle Larson, Chase Elliott, Joey Logano and Ryan Blaney — while Kevin Harvick (who is seventh in the current standings) was the 1998 series champion and is a native of Bakersfield, California. Both Blaney and Logano won their first career NASCAR races in K&N West competition. Kern County Raceway Park opened in 2013 and hosted a NASCAR Whelen All-American Series event on its opening day, and today hosts Late Model, Super Stock, Mini Stock and Spec Modified divisions. 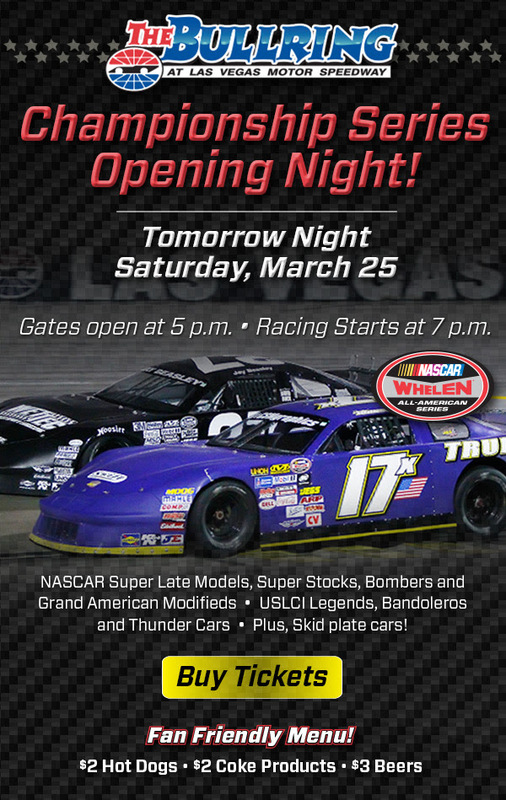 Irwindale holds bi-weekly NASCAR events, including Late Model, Trucks and Spec Late Model divisions. Tucson, Ariz. (March 18, 2017) - It was a back-and-forth battle all day, but Chris Eggleston came out on top at Tucson Speedway. Leading 80 of 150 laps in the NAPA Auto Parts Tucson 150, Eggleston beat pole-sitter and defending NASCAR K&N Pro Series West champion, Todd Gilliland, to the line to take his sixth career NASCAR K&N Pro Series West victory with his No. 99 NAPA Filters Toyota. The 27-year-old from Erie, Colorado native, said he stepped up his game for the second half of the event and is grateful to start the 2017 season off in Victory Lane after a doubtful off-season. In a way, the same can be said for second-place finisher Gilliland. Leading the most laps of the night, the 16-year-old from Sherrills Ford, North Carolina, and his No. 16 NAPA Auto Parts Toyota held off the pack on numerous late restarts to bring it home in the runner-up position for the second straight year at Tucson. The result also continues a streak of nine consecutive top-10 finishes for the NASCAR Next driver. One of the drivers Gilliland had to hold off was 20-year-old Garrett Archer. In only his second K&N West start, the Maple Valley, Washington, driver jumped his No. 27 Recruit 4 Business Ford to the outside lane on the final restart, advancing from sixth to second until Gilliland re-passed him for the spot. Still, a third-place result is a positive way to kick off the year, he says. In what was a relatively clean night of racing, there were still a handful of single-car spins that halted the action. Salvatore Iovino, who spun in final practice earlier in the day, continued to struggle with the car's handling, losing his No. 38 Infinite Wireless Chevrolet on three occasions in the 150-lapper. He was not the only one, as Riley Herbst and Rich DeLong III also lost their cars on each end of the track. On the positive end, Zane Smith came home with a top-five finish in fourth followed by Will Rodgers in fifth, while Derek Kraus, Brandon Schilling, Kody Vanderwal and Nicole Behar rounded out top 10. Eggleston's victory at Tucson, also put him in the position to win $100,000. As a part of the NAPA 500 Challenge, should a driver win all four races, they will take home the steep money bonus. The NASCAR K&N Pro Series West will be back in action for race two of the NAPA 500 Challenge Thursday, March 23 at California's Kern County Raceway Park. 1. (2) Chris Eggleston, Erie, Colo., Toyota, 150 laps, 54.938 mph. 3. (16) Garret Archer, Maple Valey, Wash, Ford, 150. 4. (4) Zane Smith, Huntington Beach, Calif., Ford, 150. 5. (8) Will Rodgers, Murrieta, Calif., Ford, 150. 6. (3) Derek Kraus, Stratford, Wis., Toyota, 150. 7. (14) Brandon Schilling, Sierra Vista, Ariz., Ford, 150. 8. (15) Kody Vanderwal, Ford, 150. 9. (6) Riley Herbst, Las Vegas, Nev., Toyota, 150. 10. (12) Nicole Behar, Spokane, WA, Toyota, 150. 11. (10) Blaine Perkins, Bakersfield, Calif., Chevrolet, 150. 12. (7) Julia Landauer, New York, N.Y., Ford, 150. 13. (9) Matt Levin, Tucson, Ariz., Chevrolet, 150. 14. (5) Ron Norman, Tucson, Ariz., Chevrolet, 150. 15. (13) Trevor Cristiani, Ukiah, Calif., Chevrolet, 149. 16. (18) Takuma Koga, Nagoya, Japan, Chevrolet, 148. 17. (20) Dan Phillippi, Los Angeles, Calif., Ford, 148. 18. (19) Bill Kann, Scottsdale, Ariz., Toyota, 147. 19. (23) Rich DeLong III, Santa Clarita, Calif., Chevrolet, 145. 20. (21) Jesse Iwuji, Carrolton, Texas, Chevrolet, 145. 21. (22) Salvatore Iovino, Los Angeles, Calif., Chevrolet, 138. 22. (11) Todd Souza, Watsonville, Calif., Toyota, 111. 23. (24) Bobby Hillis, Scottsdale, Ariz., Chevrolet, 15, brakes. 24. (17) Justin Funkhouser, Paradise, CA, Chevrolet, 1, brakes. Lap Leaders: T. Gilliland 1-4; C. Eggleston 5-24; T. Gilliland 25-30; C. Eggleston 31; T.
Gilliland 32-91; C. Eggleston 92-150. 5. W. Rodgers, 39; 6. D. Kraus, 38; 7. B. Schilling, 37; 8. K. Vanderwal, 36; 9. R.
Herbst, 35; 10. N. Behar, 34. MADERA, CALIFORNIA (March 18, 2017) - Carlos Vieira scored his first career PCS victory, as the Pacific Challenge Series presented by PenneyLawyers.com opened up its season Saturday night at Madera Speedway for the Smokey Hanoian 75. Vieira led the final 56 laps of competition but not without late company from fast time qualifier Jason Romero. "It feels awesome," Vieira said. "The car was solid man. The outside line - I felt pretty confident with it. That first restart I chose the bottom and that was a big mistake." "Man I was doing everything this car had," Romero said. "I needed another maybe 25 more laps. My front brakes were gone. I was putting rear into it, making it cut." Romero opened the afternoon with a 14.428 second lap to lead qualifying but it was Granite Bay's Cole Moore, the 2015 Rookie of the Year, winning the American Racer Tire Dash for the pole and a set of tires. Vieira chose the inside for the following restart which proved to be to Moore's favor as he led lap seven by a nose before Vieira edged back to lead lap eight. Moore finally cleared Vieira on lap nine. The next caution flag proved crucial as Romero spun down the backstretch after a mix up with defending series champion Jeremy Doss. Both drivers had to restart at the rear. Moore selected the outside on the restart and that decision not only propelled him to the lead but allowed his father John to roll into third and Ryan Philpott to roll the top into fifth. 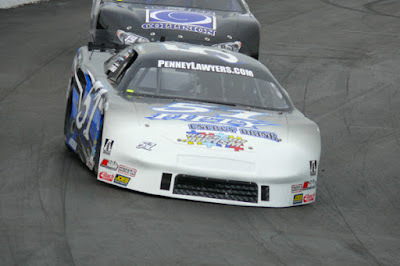 Philpott's strong performance expired on lap 14 with mechanical problems. Romero and Moore staged a thrilling side-by-side affair that gave Vieira the chance to pull his cushion to nearly three seconds. By the time Romero got away on lap 61, he ran both of his fastest laps of the race in open traffic to claw at Vieira. Vieira stayed tough in late lapped traffic for a .487 second victory - three car lengths - in the satisfying victory.